Apple of the cheek plumper, eyes more open and leave with a glow! 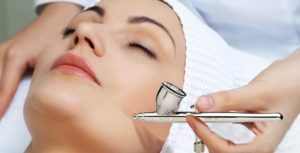 The Oxygen facial is a non-invasive skin reviving procedure that uses a machine to deploy pressurized air to deliver moisturizers to the skin. During the procedure, an airbrush-like gun is used to introduce oxygen at high pressure into the epidermis. Oxygen facials are great for all skin types! It is perfect for dry, oily and normal skin. Facial beginners, women of all ages, pregnant women, people with problematic skin (blemishes, etc.) can all undergo the Oxygen facial. There are no painful side effects associated with the Oxygen facial. The Oxygen facial is quite different from any other anti-aging treatments. It refreshes the skin naturally. The oxygen that is infused into the skin helps in cell growth and the growth of collagen. Your dull skin looks more rejuvenated and nourished. Many of the results of the facial are noticeable instantly! As one ages, oxygen can no longer effectively reach the cells. Lines and wrinkles appear on the skin and one starts to look old. The oxygen facial reduces the appearance of lines and wrinkles while encouraging the growth of new cells and helps to tighten the skin that has begun to sag with age. Oxygen facials enhance the natural beauty and restores the youthful appearances of the skin. The regenerative power of the Oxygen facial is immense. As the skin becomes hydrated and plumper the dull skin is then revived and rejuvenated. Skin that has been exposed to polluted dirty air, UV rays of the sun, all get a detoxifying cleansing treatment with the Oxygen facial. It makes the skin clean, healthy and much smoother after the treatment. Oxygen provides a healing environment for the damaged cells to repair, revive, and rejuvenate themselves. Usually, oxygen is used in treatment of burns, wounds and gangrene. Bacteria, viruses, and fungal infections cannot survive is an oxygen rich environment. It enhances the healing process of the body. Any burns, cuts, blemishes or acne will heal much faster after the Oxygen facial. Enlarged pores and pimples can all be cleared with the help of this facial. There are typically four types of Oxygen facials that provide different treatments for different problems. Opulence- This treatment is perfect for patients that have uneven pigmentation or skin tone. Furthermore, those that simply want to brighten the look of their skin for a more radiant appearance can use it too. Rejuvenate- This is designed for patients who need more moisture in their skin. It also rids the skin of wrinkles and fine lines while giving the skin a firmer, tighter appearance. Works with all skin types. Clarity- This also adds moisture to the skin by balancing out the skin’s moisture levels. It also helps rid the skin of acne breakouts. Atoxelene- This is an add-on to the opulence and rejuvenation treatments. This helps to soften and firm expression lines. This is also used to plump up the lips, contour the eyes, and smooth wrinkles. Especially effective for lines and wrinkles that at located near the mouth, eyes and on the forehead. Although the effect of the Oxygen facial is short-lived the cumulative effect is wonderful. It gives you supple, plumper, healthier and glowing skin! Getting an Oxygen facial done before a special occasion makes a drastic change to the skin. It is recommended to have monthly Oxygen facials to maintain results.